“At its very best marriage affords a man and woman the opportunity to create not only offspring but an entirely unique creature called ‘us,’” David Yount writes in Making a Success of Marriage: Planning for Happily Ever After. 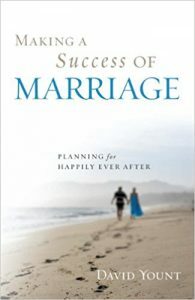 Yount presents this book as a “defense of marriage,” convinced that though wedlock fell victim “to a near 50 percent divorce rate” in recent decades, there is nothing wrong with marriage itself “and everything right with it.” What needs fixing “are the expectations that couples bring to it and the strength of their commitment,” he says. What impressed itself on me was the book’s multidimensional presentation of married life. Without slighting a couple’s personal relationship, Yount situates marriage within a larger context. Money: Yount’s chapter on a couple’s home-based financial responsibilities offers more pragmatic, down-to-earth advice than is found in most books on marriage. “Budgeting simply means knowing where your money is going so you can be assured of having enough of it when you need it,” he observes. Marriages today, more than ever, require “courage, clear-sightedness and commitment,” Yount insists. Every marriage “will be tested by circumstances beyond [the couple’s] complete control” — “illness, accident and financial strain.” A healthy marriage survives such tests “by putting hope and trust ahead of anxiety,” says Yount. Yount suggests that people contemplating marriage seek “someone who will affirm who you are and what you stand for.” A lasting marriage is “one of shared values,” he says. Yount, a Quaker, writes in light of this faith, as well as his pastoral-counseling experience. He has authored 13 books and a syndicated column; his book recalls experiences as a Marriage Encounter leader. Yount’s long-lasting marriage, his second, came after what he calls an “ill-advised” first marriage. This book adds to the expanding library of literature in “the marriage movement,” fostered by religious leaders of varying faith backgrounds, psychologists, sociologists, TV personalities and other commentators. If these people approach marriage from differing perspectives and bases, what unites them is the conviction that marriage remains a viable institution in which couples can truly and happily succeed. Keep Christ at the center of your wedding day, and your marriage.